The AG-AC8PJ is an incredibly powerful, Full-HD 1080P shoulder-mount camera that features exceptional ergonomics, functionality and pricing. The AC8 is ideal for shooting weddings, business conferences, documentaries, sporting events (including 720p at 8Mbps), exhibits and government activities. 720p at 8Mbps (PM mode) is ideal for use with the leading sports coaching analysis software. Dynamic Range Stretch (DRS) which helps compensate for wide variations in exposure in a contrast heavy scene, from light to dark. A Focus in Red function shows the sharp edges of your subject in red, making it stand out easier, allowing a shooter to find focus even faster in some situations when manual focus is in use. Powerful 5-Access Hybrid Optical Image Stabilization (O.I.S) -- Thoroughly suppresses blurring all the way from wide-angle to powerful zoom shots. This lets you capture crisp, clear images in almost every shooting situation. A 1/4.5 type high sensitivity sensor ensures bright and sharp images even in the most dimly lit scenes. A manual, multi-purpose lens ring provides fine adjustments and precise control of Focus, Zoom, Iris, White Balance and Shutter speed. Fast, accurate auto focus is also available. An illuminating LED ring allows recording verification and serves as a tally light to make shooting smoother. Users can turn the illumination on/off. Hours of shooting can easily be backed up to an external portal HDD via USB. 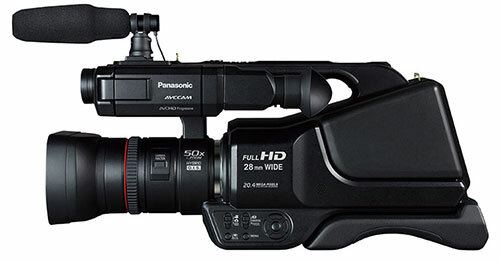 With its Level Function mode, the camcorder automatically detects and corrects the tilting of captured images. It records more horizontal images without tripod or even when shooting in an unstable position. A large lens hood blocks light more effectively to reduce lens flare. 3”, 16:9 touch-panel LCD Viewfinder (460,800 dots). New high-performance stereo microphone (included). Eye-Fi SD card compatibility making the transfer of recordings via a wireless network to devices like a PC or a file-sharing site like You Tube or Vimeo fast, simple and convenient. All operational switches are grouped together, and battery and input/outputs are located in the rear for easy access. Interfaces include HDMI TypeA, Microphones (stereo mini), Headphone (stereo mini), USB 2.0 Hi-Speed Host/Device, AV, and Video Component. Captures still images of 16:9, 20.4 megapixels [6016 x 3384 resolution] image or a 4:3, 15.1 megapixels [4480 x 3360 resoution] still image. In simultaneous record mode, it can take a 16:9, 9.4 megapixels [4096 x 2304] still image or a 4:3, 1.4 megapixels [1440 x 1080] still image. Standard Accessories include AC Adaptor, AC Cable, Rechargeable Battery Pack [2900 mAh/Lithium-ion], AV Cable, USB Cable, External Stereo Microphone, Lens Cap, Eye cup. Weighs 5 pounds and its dimensions are 8.07” (W) x 8.54” (H) x 18.85” (D). 3-Year limited warranty (1 year + 2 extra years upon registration). Its wide angle 28mm/F1.8 lens allows you to fits more people and background into the frame, especially useful in narrow spaces. A powerful 21X optical/50x super-high resolution zoom permits you to shoot scenes that you can't get close to. Intelligent resolution technology lets you shoot at high zoom rates while preserving the image resolution. With dual SD card slots and the capability to record on both cards simultaneously, the AC8’s Relay Auto Switch functionality provides dependable back-up recording or the ability to switch from one card to the other for extended recording times.